We've taken the advice of some of the movers and shakers in the business and have put all of our herd on our sales list. Does this mean that we are planning on exiting the alpaca business? Absolutely not! This simply means that we aren't holding back our best animals. 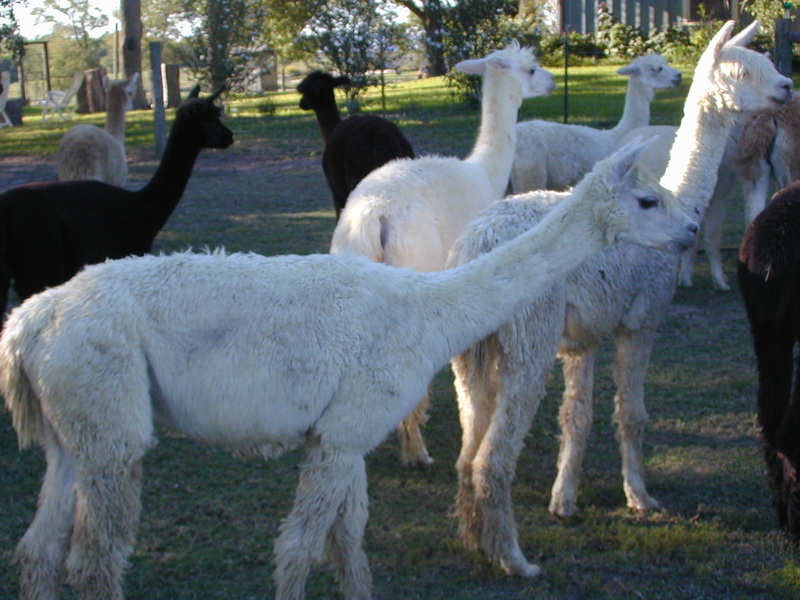 Whether you are just starting your herd or want to add some new bloodlines to an existing herd, each and every one of our alpacas is available for purchase. If you would like to see any of our Alpacas in person, please drop us an email or give us a call. We'd be happy to have you visit our ranch. And there are other Alpaca ranchers in the area. Make a day of it and visit multiple ranches in a single trip! To view any picture in an enlarged format, click on the picture. Click on the ARI # to view the ARI Registration Certificate. 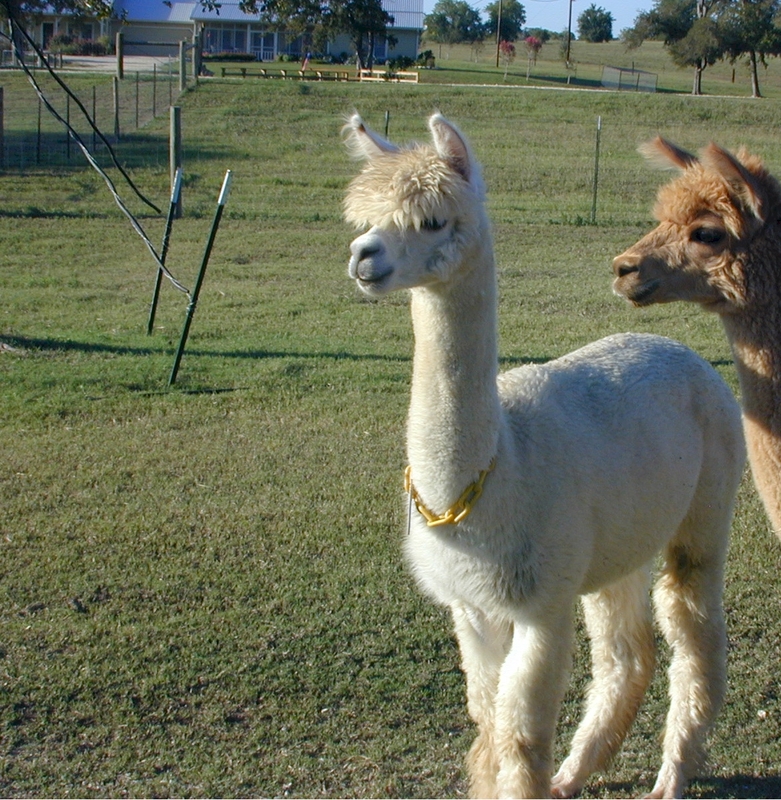 Package deals available for the purchase of 2 or more alpacas. Free breeding with the purchase of any maiden female. Free re-breeding with the purchase of any pregnant female. Flashdance is a nice medium fawn Bolivian suri female. Flashdance is a proven mom and has birthed several beautiful crias. She is currently open and ready for breeding. Mia Bella, Flashdance's most recent cria, is a big spunky girl. She is medium fawn with soft fiber showing plenty of luster. Mia is currently open and ready for breeding. Noel was born to Flashdance, sired by Qaint Augusto, a true black Chilean herdsire. Noel is solid white, exhibiting nice fiber with good lock structure and lots of luster. She is a friendly girl and will eat out of your hand. Noel is easy going and has been a companion for other females when needed at the vet clinic. She is currenlty open and ready for breeding. Apricot Rose was born to Flashdance on November 16, 2004. Sired by Ricardo’s Samson, she is a cute little light fawn girl with great pencil locks and a color pattern similar to her mom. Apricot Rose won a blue ribbon in her class at the 2006 Houston Livestock Show. Crystal was born to Shiloh, sired by BSA Pirate. Crystal is solid white and her fiber has lots of luster with nice lock definition. She is friendly and will eat out of your hand. Crystal is a proven mom. 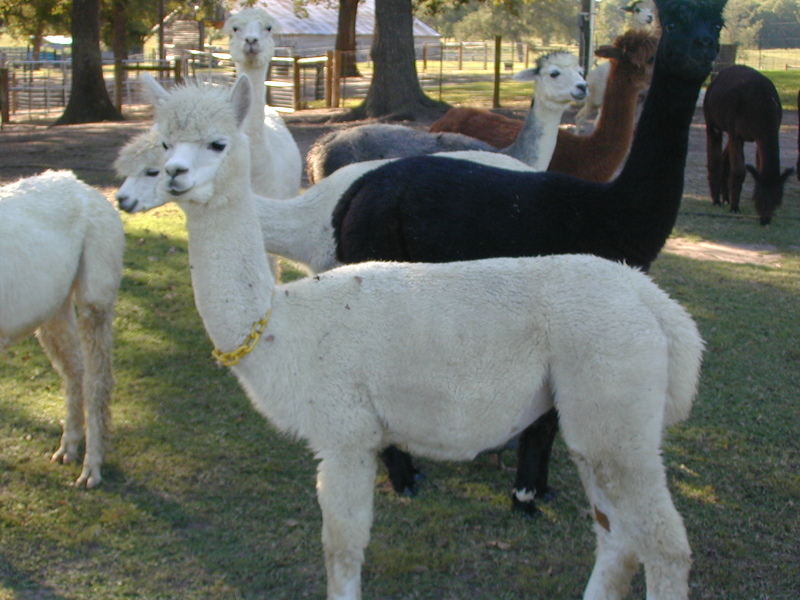 Her cria include Starbuck won grand champion among all male and suri females, 1 year and older, at the 2006 Houston Livestock Show. 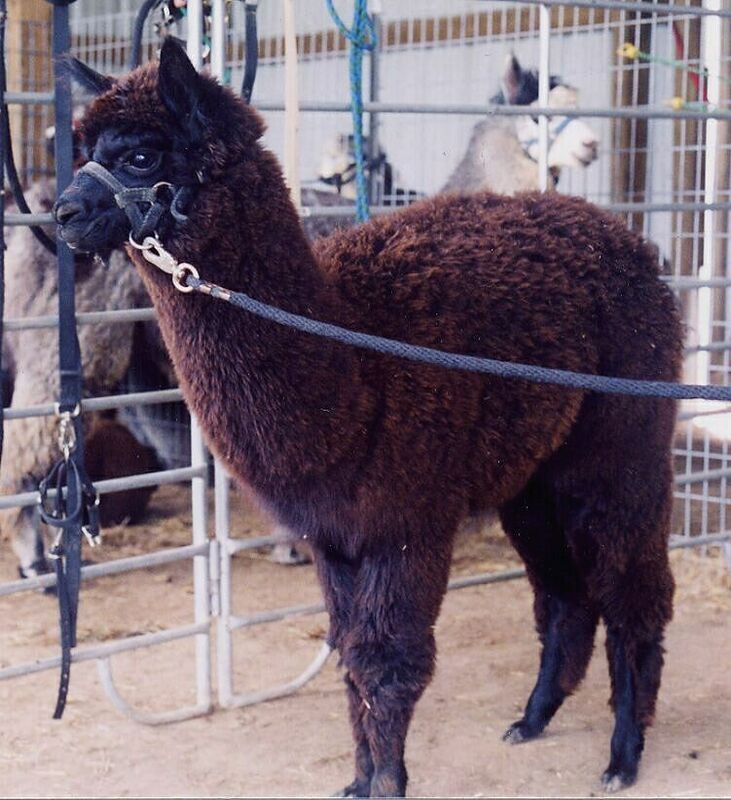 Crystal was bred to HASA Marley, a 3/4 Peruvian, award winning true black herdsire, and had a very nice dark brown female cria (Alexis Grace) on February 16, 2009. Crystal ws re-bred to Marley and on March 2, 2011, birthed another girl. Crystal is currently bred to Cuervo Gold for a March 2012 cria. White Diamond was born to Crystal, sired by Fuzzy's Francisco. She is a big girl, weighing 17.2 pounds at birth, with nice lock structure and outstanding luster. White Diamond is currently open and will be bred in February 2012. Alexis Grace is a spirited dark brown girl, born to Crystal, sired by HASA MArley, a 3/4 Peruvian, award winning true black herdsire. Alexis is our first dark solid-color suri and we are excited about her breeding potential. She won color champion in the dark suri class at the 2010 Houston Livestock Show. Alexis will be bred to Ruger, a silver grey male in February 2012. With her black genetics, this should produce a fabulous cria. Anabella was born to Crystal, sired by HASA Marley. She is white with just a hint of light fawn along her back topline. Anabella shows nice lock structure and outstanding luster. She will be ready for breeding in the late winter/early spring of 2013. Windwalker was born on June 26, 2002. He is a multi-color dandy, sporting several shades of fawn plus white. He is a fabulous Public Relations Alpaca; and has wowed the crowds at the Houston Livestock Show for several years in a row, taking the prize of Reserve Champion in Public Relations in 2004. He also participated in the Loan-A-Llama event at the Houston Livestock Show. (Loan-A-Llama is where kids, with little or no livestock experience, borrow a Llama or Alpaca and take them through an obstacle course). With no prior obstacles experience, Windwalker helped win ribbons for several excited youngsters. Mr. Reliant was born to Anenome, sired by Ricardo's Samson and is a classic example of what can be accomplished by "breeding up". Drawing from the excellent fiber of his sire Ricardo's Samson, Mr. Reliant exhibits fine white pencil locks with great luster. Mr. Reliant has won several blue ribbons, at both the Houston Livestock Show and the TxOLAN Alpaca Spectacular. He would make a great herdsire for any ranch. 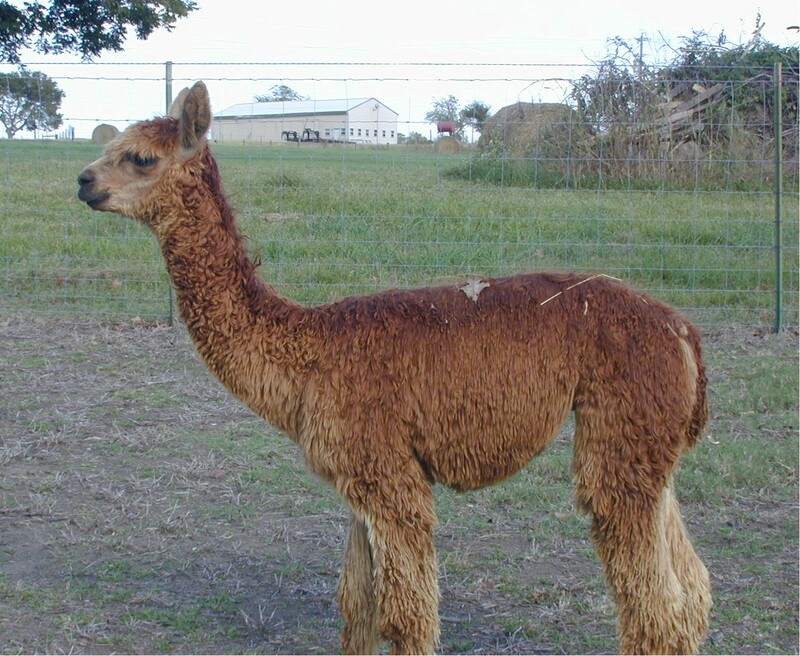 Rebel is Flashdance's first cria, sired by James Dean (medium fawn). Rebel has black skin with nice white fiber. He is small; but is gentle and cute as can be. Rebel has been with us to Dickens On The Strand in Galveston and has participated in several parades. He could be the perfect alpaca for young children or for nursing home work. Taz is a dark fawn male born to Anenome, sired by Ricardo's Samson (dark fawn). Taz's fiber shows great lock structure and nice luster. Pistol Pete is white and is Crystal's first cria. Pete was sired by Angel's Advocate, an award winning 3/4 Peruvian herdsire. Pete has nice fiber with great lock structure and luster. Rocky is multi-color, sporting white and shades of dark fawn to light brown. Even the white fleece on his neck and chest is spattered with color, giving a tweed effect. Rocky was sired by Angel's Advocate (3/4 Peruvian bay black). Rocky has won several blue ribbons, at the Oklahoma Blastoff, TxOLAN Alpaca Spectacular and Houston Livestock Show. At a recent show, the judge commented "Get this guy in your breeding program!" He is ready to go. Our shearer, who sees alpacas all across the US, commented "He is the nicest multi-colored suri male that I've seen in a long time". Rocky is one of our resident herdsires. With his sale, we reserve the rights to 4 future breedings. Sgt. Pepper, born to Shiloh in November 2005, is multi color, sporting white and medium fawn. This little guy has incredible fiber and a great disposition. Sgt. Pepper was sired by Qaint Augusto, a true black Chilean herdsire. Starbuck was born to Crystal, sired by Angel's Advocate (3/4 Peruvian bay black). He is medium fawn with some white on his head and neck. His fiber is dense with good lock structure ands lots of luster. In 2006, Starbuck won grand champion among all male and female suris, 1 year old and up at the Houston Livestock Show. With his sale, we will reserve rights to 4 future breedings. Thor is a dark fawn suri male with a nice gentle disposition. Thor has excellent fiber with great lock structure and lots of luster. 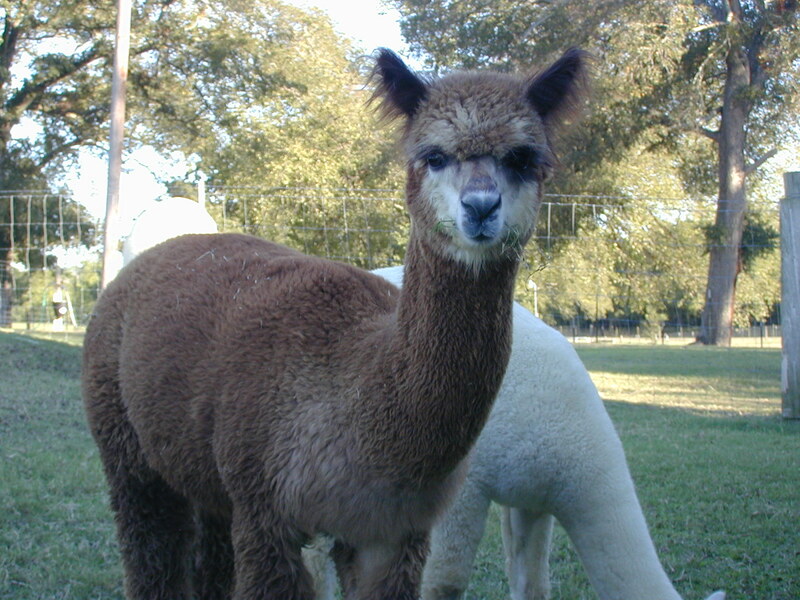 Thor placed first in his first show at the 2006 TxOLAN Alpaca Spectacular and second behind the grand champion Starbuck at the 2006 Houston Livestock Show. Thor has herdsire potential. Sundance is a multi color (white/medium fawn) male. His fiber is nice with lots of luster and great lock structure. He is a herdsire in the making. Valentino was born to Crystal, sired by Qaint Augusto, a true black Chilean herdsire. Valentino is multi color, sporting white and medium fawn with great lock structure ands lots of luster. Valentino has a very good personality and is very easy to work with. Valentino began winning his share of blue ribbons this year at the Oklahoma Blastoff, TxOLAN Alpaca Spectacular and Houston Livestock Show. He is a herdsire in the making. Tabasco is a full Bolivian medium fawn male, born to ANenome, sired by Pure Panache. His fiber looks great, with lots of luster and nice pencil locks. Tabasco is one of our herdsires. His first cria is due on our ranch in march 2012. Magi is a solid white male born to Anenome on Christmas Eve 2008. His fiber has lots of luster and nice pencil locks. Magi carries the black genetics of his sire (HASA Marley, a 3/4 Peruvian, award winning true black herdsire). Harvey is a solid white male born to Shiloh, sired by HASA Marley, a 3/4 Peruvian, award winning true black herdsire. His fiber looks great, with lots of luster and nice pencil locks and he carries the black genetics of his sire. Max is blackish brown with white on his head and neck. He is soft with lots of luster. Max is very personable and will eat out of your hand. Sheba's mom is Silver Bell (medium silver grey). Sired by Our Eduardo, Sheba is solid black with nice soft, dense crimpy fleece. She is a big girl like her mom and good breed stock, bringing excellent fiber and conformation to the table. Sheba is currently bred to Mixtlie (medium rose grey) for her first cria in the spring of 2012. 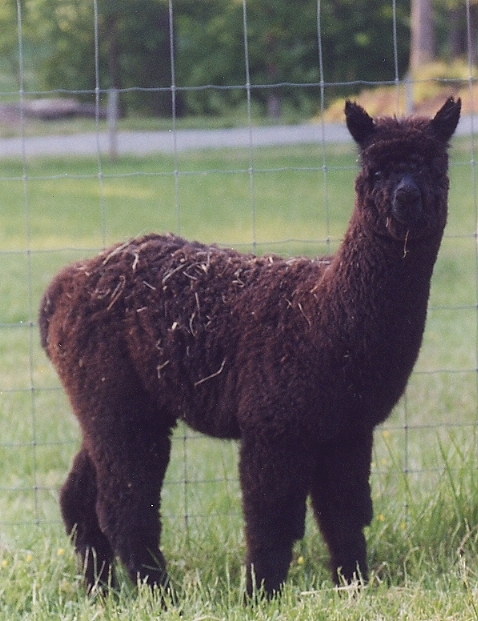 Chocolate Kiss is Silver Bell's first cria, born on February 17, 2005. This little girl is a dark chocolate brown with crimpy dense fiber and was sired by Enchantment's Cerrillos (a full Peruvian dark fawn son of Dom Lucilio - who sold at auction last year for $400.000!!). CK just placed third in a large class at the 2006 Houston Livestock Show. She will be ready for breeding this fall and we plan to breed her to a silver grey herdsire that won reserve champion at the 2006 Houston Livestock Show. When this little girl was born, we immediately called her Ms. Peachy because of her peachy color. She has dense, crimpy soft fiber. Born on November 17, 2004 to My Classy Lady, Ms. Peachy is a light fawn full Peruvian. She was sired by a full Peruvian herdsire, Hot Chocolate, a dark brown Peruvian Matador son. Ms. Peachy is friendly and is easy to approach and we can almost always give her a hug around the neck. 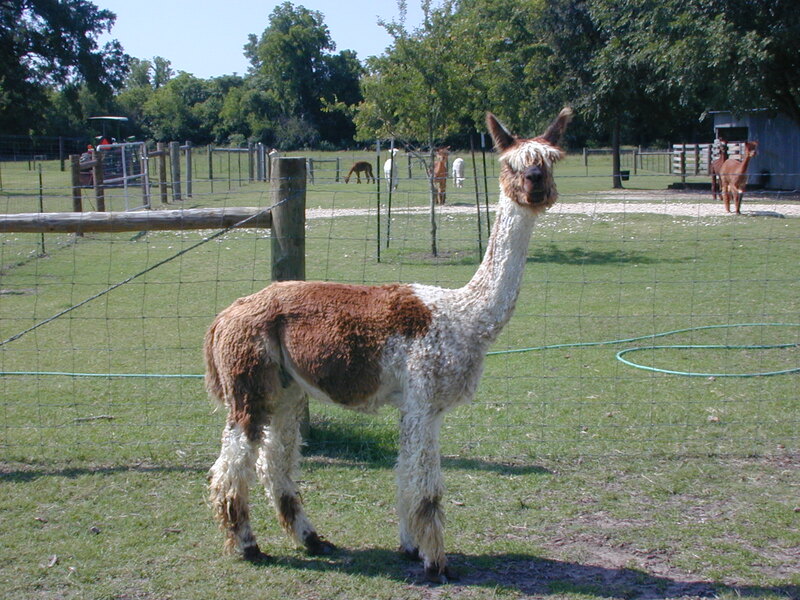 Ms. Peachy is currently bred to Aladdin of KPR, a full Peruvian bay black herdsire, for a March 2007 cria. Aladdin has very uniform crimpy fiber with a soft handle. His crias have exhibited silky crimped fleece with full coverage from head to toe over a heavy boned frame with very correct conformation. Inca Princess was born to Smokey on February 1, 2006. 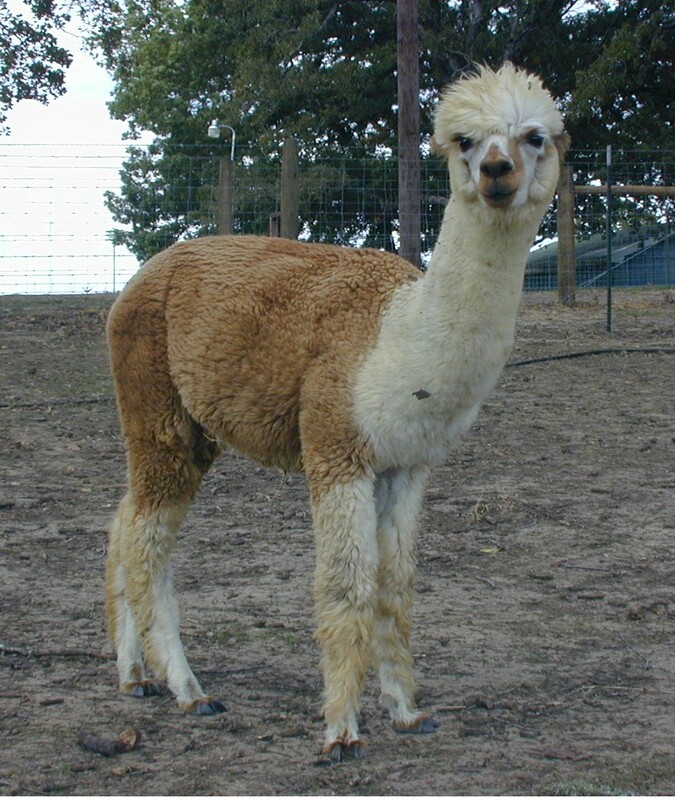 Sired by Prince Charming (light fawn), she is a cute little girl with soft, crimpy, dense fiber. Inca Princess is a medium fawn with a white face and hints of gray around her ears and topknot. She is friendly, easily approachable and has a gentle personality. This little princess will be ready for breeding in late spring 2007. Born on June 17, 2003. Dam is Peruvian Fascination and sire is Peruvian Hot Chocolate. Lois is a medium fawn and white pinto with fabulous fleece. Lady Lois placed second in her class at the Sun City Sizzle, 2004 in El Paso. Lois will be ready for breeding in the fall of 2004 to the FFTX herdsire of your choice. When Lil was born in January of 2005, we thought, "What a Cute Little Thing!". Soon thereafter and to this day, we started calling her Lil. Diamond added a level of sophistication, so Diamond Lil it was. Lil has a very soft, crimpy fleece, is big boned and good bred stock. She is another one of our friendly girls that is often approachable in the open pasture. Lil is currently open and will be bred for a spring 2013 cria. Elvira is true black from both true black parents. She is ½ Peruvian, born to full Chilean Samantha and sired by full Peruvian Cartel. Elvira has nice soft fiber and a pretty face. She is friendly and will eat out of your hand. 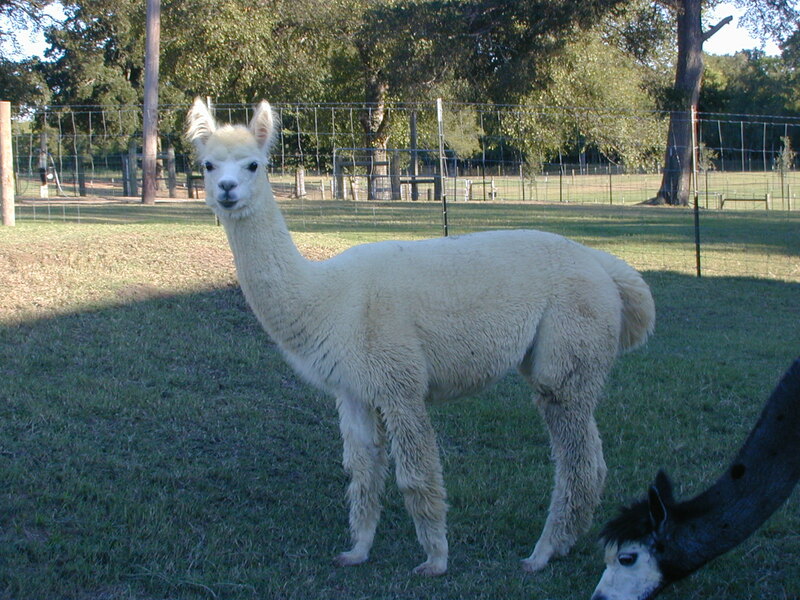 Elvira has been bred to Checkmate (medium silver gray) for a April 2007 cria. Vanity Fair is a white full Peruvian female, born on October 30, 2004. She has very dense, soft fiber with a micro crimp. She has a pretty face and head with good overall body conformation. 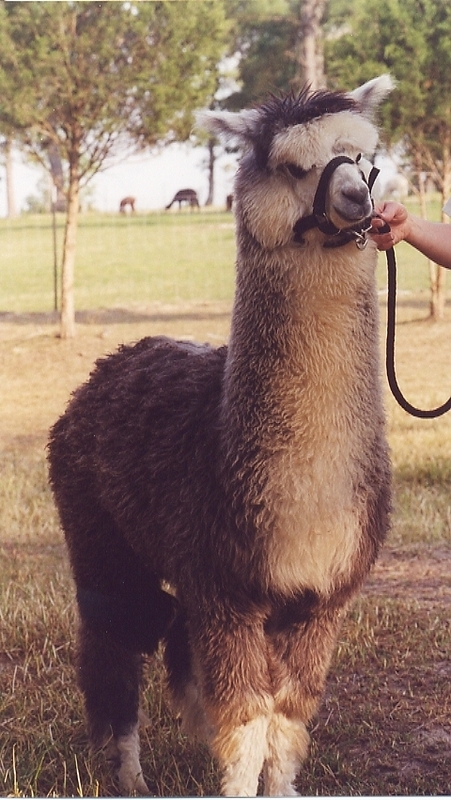 Vanity Fair has been bred to Hot Chocolate, a dark brown Peruvian Matador son, for a April 2007 cria. Empress is a white full Peruvian female, born on March 2, 2004. She has soft fleece and consistent dense coverage. 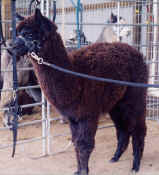 Empress has been bred to Peruvian Cartel, a bay black full Peruvian herdsire, for a February 2007 cria. 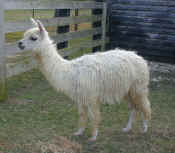 Born on May 21, 2005 to Cinnamon Song, sired by Sundancer, Chloe is half Peruvian/half Chilean and light fawn in color. She has a pretty face and head and her fiber is soft and dense. She is friendly and will eat out of your hand. Chloe will be ready for breeding in late fall or winter of 2006. Carissa (white) is a good mom and easy to work with. Her previous male cria (King Aslann) is medium fawn with incredibly crimpy fleece. He is one of our herdsires. Carissa was bred to Altair's Vito (a very dense, medium fawn herdsire) and had a very nice fawn female cria (ViVi) in early 2009. Looking at Aslann and ViVi, you can see the type of cria that Carissa can produce. She was bred to Crescent Moon's Metolius and on March 6, 2010 birthed another girl (Starlight). Carissa will be bred this Fberuary 2012 for a January 2013 cria. Born to Carissa, Starlight is a cute, spunky medium fawn girl, sporting nice soft crimpy fleece. She will begin her breeding career in the late winter or early spring of 2012. Cocoa Chewy is a beautiful chocolate brown with black markings on her legs and face. Her fiber is soft and very crimpy. Cocoa Chewy will be bred in February or March 2012. 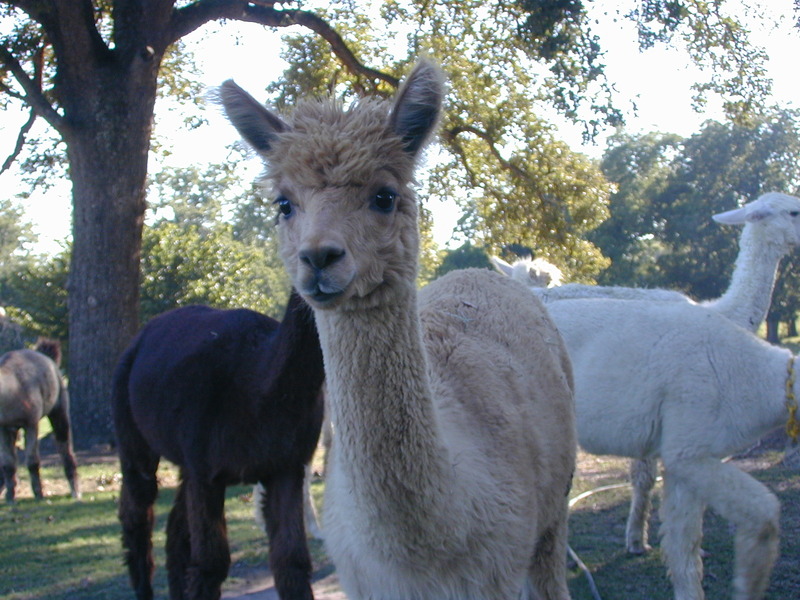 We bought Hallie in December 2006, sight unseen, based on the quality of her cria. In fact, her first cria is Our Eduardo, the sire of Silver Bell's cria, Queen of Sheba. All of Hallie's cria have been exceptional and her cria born on February 24, 2008 did not disappoint us! She is a beautiful chocolate brown girl (Cocoa Chewy) with soft, dense crimpy fleece. Hallie was bred to Long John SIlver, an award winning silver grey herdsire and had a very nice true black male (Callahan) on February 16, 2009. He is one of our herdsires. 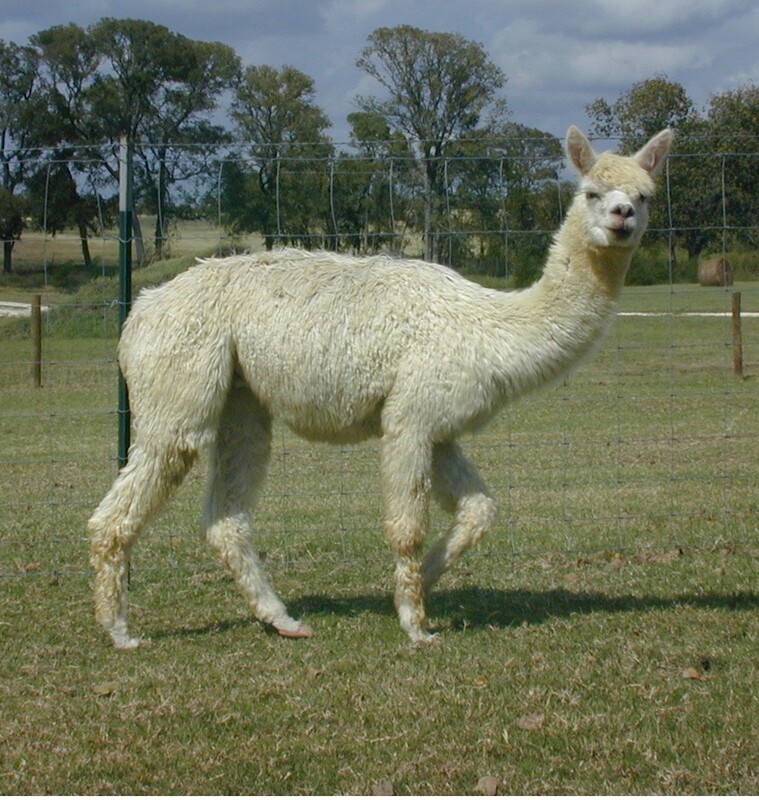 Hallie is currently bred to Snowmass Matrix Magic, a Color Champion at the 2010 Futurity Show in Oklahoma City for a February 2012 cria. ViVi is a medium fawn female born to Carissa in early 2009. ViVi was sired by Altair's Vito (a very dense, medium fawn herdsire) and is exhibiting the same fabulous fleece. She is one of our best PR animals and loves to schmooze with visitors to our ranch. ViVi has been bred for a spring 2012 cria. Victoria is a multi-color female born to Sugar & Spice in December 2008. She has wonderful dense and crimpy fleece. Victoria will be ready for breeding in early spring 2011. Emma is a true black female born to SIlver Bell in February 2009. She will be bred Feb/March 2012 to King Aslann for a 2013 cria. Cinnamon is a medium fawn female born to Diamond Lil, sired by Macho Cocoa. Cinnamon is very laid-back and is cute as can be. Cinnamon will be bred Feb/March 2012. Izzy, sired by Poseidens Isaac, is medium fawn and has a very dense, soft fleece. While at her previous ranch, Izzy suffere heat stress. This caused some stiffness in her legs, which is still visible today. She can throw a grey cria, when bred to grey. Izzy is being bred to Callahan for a spring 2013 cria. Sabrina is a pretty 3/4 Peruvian light fawn female. She had a cute cria from Macho Cocoa (bay black with grey genetics) May 2011. Sabrina had some milk issues with her previous cria, not producing the quantity we would like to see. Sabrina is due spring of 2012, bred to Callahan (true black). Kissy is a bay black female, born to Sabrina and sired by Macho Cocoa. She is a bit small for her age, but is incredibly soft. Kissy should be ready for breeding in the late winter/early spring of 2013. Greystoke is a nice silver-gray huacaya male with a mellow disposition. His fiber is very soft with a nice tight uniform crimp. Greystoke will be three years old on April 26, 2002. He is halter trained and leads well. He did great in the parades at "Dickens on the Strand" in Galveston; and was a big hit during his photo session in the antique store. He also performed great during the Loan-A-Llama event at the Houston Livestock Show in 2002. If you are looking for gray, or just looking for a gentle, easy-to-work-with Alpaca, come give Greystoke a look. Magnum is a true black huacaya male. He is halter trained and has a very soft fleece. He would be a perfect alpaca for a spinner or weaver. Jedi will reach age 3 in early December. His sire is Brittany's Desperado (the highest priced selling alpaca at the Lanarks Legacy Sale) and Jedi is showing the same mellow disposition and stature. He is easy to work with and leads well. His fiber has nice luster and a nice broad crimp. 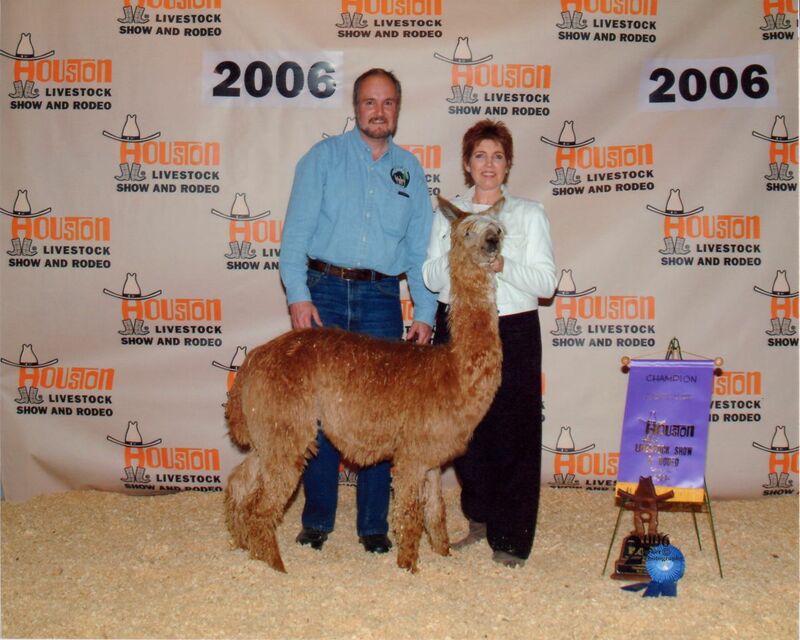 Like Windwalker and Greystoke, Jedi participated in the Houston Livestock Show Loan-A-Llama with great success. If you are looking for a black huacaya male, Jedi could be a great addition to your herd. 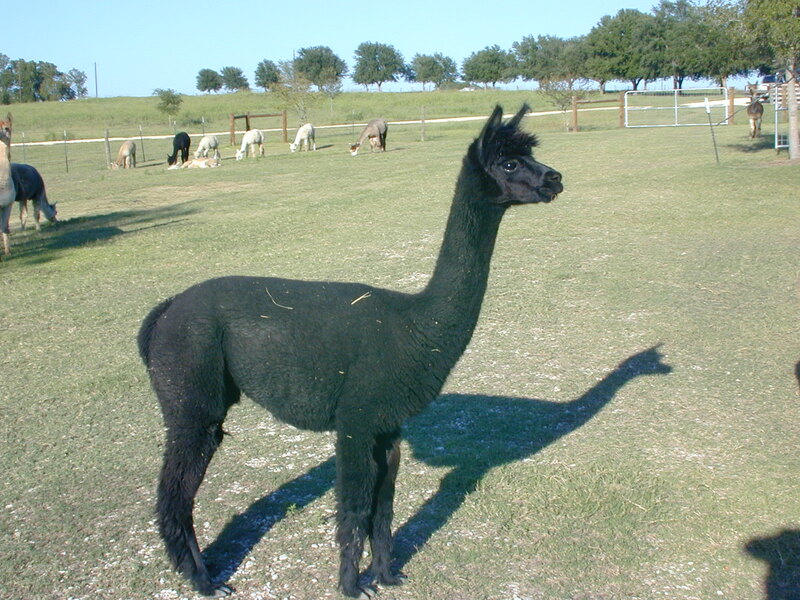 Dynamo is dark fawn and was born on March 29, 2003, sired by Accoyo Peruvian Fabio. Tycoon is white and was born on August 25, 2003, sired by Valiant, son of Peruvian Victor. "Tex" is true black with soft fiber and was born on November 15, 2004, sired by Rameses, son of Bolivian Black Thunder. Texas Tea is very friendly and cute and will make a great fiber animal. Morocco is black with white frosting around his face. He was sired by a full Peruvian herdsire, Hot Chocolate, a dark brown Peruvian Matador son. Morocco has a very soft, crimpy fleece and is ready to begin his career as a herdsire. With his sale, we reserve the rights to 3 future breedings. Cibolo was born on November 19, 2004 and is dark fawn. He was sired by Victor's Valiant (son of Peruvian Victor). Jupiter was born on November 27, 2004. He is solid white full Peruvian male, sired by Peruvian Prince Andrew. He has Hemingway, Fabio and King Solomon bloodlines in his background. Jupiter has very soft, dense, bold fleece from head to toe. Picasso was born on November 24, 2004 and is a full Peruvian medium fawn male, sired by Peruvian Cartel (bay black). He has a nice typey head with dense, soft fiber from head to toe. Picasso is easy to work with and will eat out of your hand. Leo, born in February 2005, is a white full Peruvian male, sired by Hot Chocolate. Leo has elite fleece, consistently soft and dense with lots of crimp. This junior herdsire is friendly and easy to work with. Duke, born in November 2004, is a medium fawn male, sired by Los Bandelero. Duke has a very dense, soft fleece and is easy to work with..
Aslann, born to Carissa in October 2007, is medium fawn with fabulous crimpy, soft, dense fleece. Almost everyone that visits our ranch notices him. One visitor even spotted him all the way across the pasture, asking "Who is that?" He placed third in a large class of 10 at the 2010 Houston Livestock Show. Aslann is one of our resident herdsires. With his sale, we will reserve rights to 5 future breedings. Callahan is a true black male born to Hallie in February 2009. Callahan has developed nicely, exhibiting very nice fleece with incredible crimp and softness. He was shown at the 2011 Houston Livestock Show, where the judge loved his fleece fineness, structure and crimp. Callahan is one of our resident herdsires. With his sale, we will reserve rights to 5 future breedings. 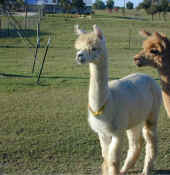 Wooly is a solid white 7/8 Peruvian male, born to Diamond Lil in january 2009. Wooly sports soft, dense crimpy fleece all the way down to his toes. He is a sweet boy. Cisco is light brown with a nice dense fleece. Cisco is a grandson of PPeruvian Dracula, a highly respected herdsire at Magical Farms in Ohio. He has several nice crias on the ground. Iron Man is a medium brown male born to Hallie, sired by Cisco. He is a sweet boy and his fleece is very soft with a maroon tone to it. Inca is full Peruvian, medium fawn and is a herdsire in the making. He has very crimpy, dense fleece. Wit his sale, we will reserve rights to 5 future breedings.